It was a busy week. I looked at the calendar and realized that I needed to get things ready for the classes I am teaching at the Tenntucky Fiber Arts Autumn Retreat. I have learned the hard way to prepare kits for classes instead of asking students to bring yarn and since I am teaching intarsia and there are 23 + students I was busy winding balls of yarn. I also had to get the handouts ready. All of this takes time. Also, starting in October, I will be doing an additional blog for the TKGA website. It will focus on the things I do for TKGA as well as my design process. I'll focus on the designs I do for Cast On. Sadie is coming up with a format. I just have to provide text, photos and videos. I am glad to say that I am starting to get lessons to review and I have heard from several students who started the course but let several years go by. Again, I am happy to review work even after several years. Just send me an email and I will send the updated course materials. I'm jumping around again. This week's tip is about one method for doing a provisional cast on. Next week I will do a different techinque. My current projects often drive what I do for the tips. I will be doing two additonal tips about short rows...again, my current project uses short rows and I made an effort to use a different technique. You use provisional cast ons for a variety of reasons. Most frequently you see it in projects where the cast on edge is joined to the bind off edge. Instead of seaming, you graft the live stitches. I've seen patterns where there will be some sort of applied edging. Yes, you could pick up stitches along the cast on edge but the edge will be more elastic if a provisional cast on is used instead.where you want to seam the cast on edge to the bind off. The most common way of doing a provisional cast on is the crochet method. 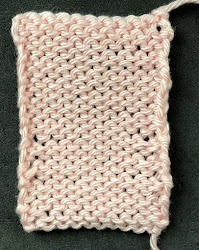 In this technique you use a crochet hook and waste yarn to make a chain. You then pick up stitches in the "bumps". For the waste yarn I find it easier if I use a slipperly yarn for the chain. I also try to use a very different color from my project yarn. I make each stitch in the chain fairly large so that it is easier to see the bumps. And finally, I always tie a knot at the yarn tail at the end so I can remember which end to unravel when I remove the waste yarn. Here is the back side with arrows pointing to the bumps. Once the chain is complete, you pick up stitches in bumps. The next two photographs show both sides. The other way I do a provisional cast on is to put the live stitches on the cable of an interchangeable needle. This way you don't have to worry about waste yarn. Next week...that technique. I have made a start on the jacket. I am using a provisional cast on and short rows in this project. More details later.